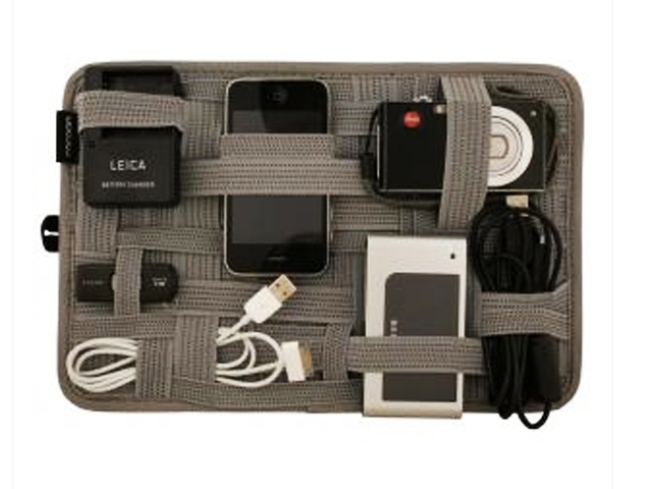 Park your gadgets safely in a Grid-It. ON THE GRID: The clever Grid-It organization system – a flat-packing way to keep your gadgets and gizmos secure, thanks to a genius use of rubberized and elasticized fasteners on a rectangle – fits right into your laptop case, guaranteeing that your tech goods stay put and you won’t be fishing around at the bottom of your bag for a cable connector that… wait, what is this one for again? $22 at Flight001 (where they’re having a spend-$50-get$10 off (and up) sale. Find a store near you. REMEMBRANCES: Roseanne Cash has assembled a lineup of songs her late father, Johnny Cash, felt made the list of great American songs, on her new album, appropriately titled “The List”. Guest vocals come courtesy of greats like Bruce Springsteen and Elvis Costello, but they never steal the spotlight away from Cash’s heartfelt tributes to the musical tastes passed down by the Man in Black. $18.98 at SoundFix, 110 Bedford Avenue, Williamsburg; 718-388-8090. EXHALE: Booking an hourlong Youth As We Know It Facial at Bliss Spa ($185) gets you a complimentary brow wax (a $30 value) through October 31. And get even smoother with 20% off their hair-removal products. Whisper the code “hairy” at checkout (seriously). Find a location near you.